An excursion dedicated to the carefree Dubai lifestyle: shop in two marvellous locations - one more modern and cosmopolitan and the other more traditional and picturesque - enjoy a cocktail in an exclusive ultra-elegant bar and witness an ‘Arabian Nights’ water, light and music show. We leave the port behind us and head to our first destination: City Walk, a modern innovative open-air shopping mall characterised by large tree-lined streets, European-style architecture, fountains with spectacular water features, covered areas and children play areas. Here we have some free time available to wander around the prestigious boutiques, refined restaurants and shops of all kinds looking for the perfect souvenir. We then move on to our second destination, the exclusive Rooftop Burj Club on the third floor of the Burj Khalifa skyscraper that towers over the club’s panoramic terrace with its vertiginous height. We sip a refreshing cocktail as we enjoy a perfect view of the spectacular dancing fountain show in the square in front of the skyscraper. The fountains move to the rhythm of the music creating an enchanting choreography with illuminated water jets. 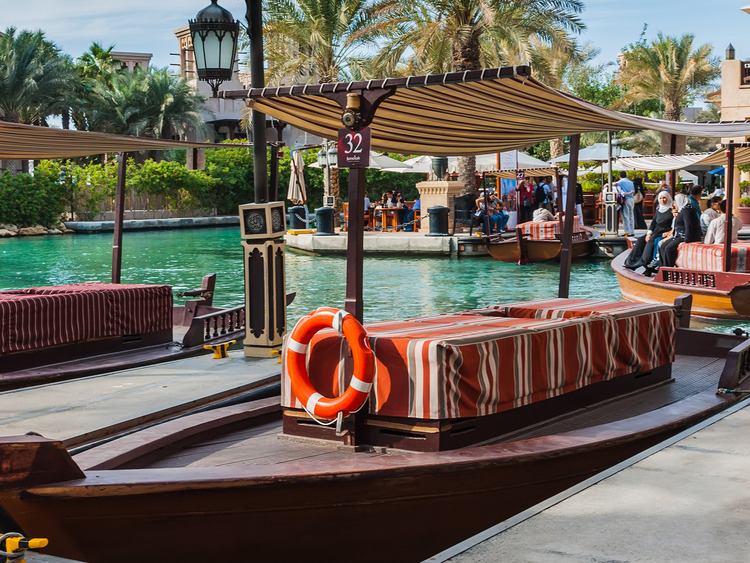 The last stop on our excursion is the Souk Madinat Jumeirah, a shopping centre that recreates the architecture and setting of an old, traditional Middle-Eastern market where we can find a wide selection of pashminas and local arts and crafts.